Here’s a simple and easy to set up funkana* idea found on the website of the High Desert Region of the Porsche Club of America. The object was to pop a balloon with the right rear tire of the car. This was just one of the stations from the club’s 2010 event. The balloon concept is so versatile that we think it would be fun to create an entire funkhana using balloon targets. The popping noise is sure to attract attention to the funkhana and help build a crowd of spectators. Balloon locations can be marked with chalk and fastest time would determine the winning team. Using 4 balloons, require the team to pop one with each tire. For the right side tires, the passenger must navigate while the driver steers. For the left side tires, the passenger would take control of the steering wheel while the driver navigates and operates the foot pedals. 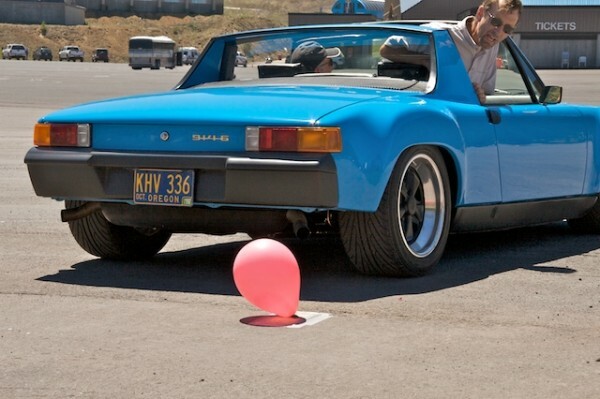 Instead of driving over the balloons, pop them using a broom stick with a finish nail driven into the tip. Set up as many as 10 or 12 balloons in a random pattern similar to the Honey-Do Funkhana. This works great where space is limited and puts a premium on figuring out an efficient route that minimizes the amount of shifting from forward to reverse and back. For a large parking lot, balloons could have different point values based on color. Then allow a set time (such as two minutes) for a team to pop balloons and try to earn the most points. You can always add a handicap such as driving backwards or using a blindfold. Check with a local craft or hobby store for supplies and ideas how to secure balloons to the pavement. For a grass area, golf tees can be used to tether balloons.